Supreme Court Justice Ruth Bader Ginsburg may have been released from the hospital and given a positive prognosis, but Mother Jones is still mad at her. Mother Jones tweeted an article, first published in late November, suggesting that the good news regarding Ginsburg’s health is overshadowed by the fact that she chose not to retire when former President Barack Obama could have chosen her replacement. About a week before her latest fall, I sat through a pair of tedious Supreme Court arguments about arbitration, so I got to see the Ginsburg most Americans do not. She was engaged in the arguments, but her speech is increasingly difficult to understand. As has long been the case, people strained to listen when she asked a question—a hot bench went quiet. When a Supreme Court session adjourns, the public isn’t allowed to depart until all the justices have left the bench. After the arbitration arguments were gaveled to a close, I got up to leave with the rest of the onlookers. But then everyone stopped. All of the justices had left except for Ginsburg, who was having trouble getting out of her chair. There was an embarrassed silence as members of the press, the bar, and the public tried not to gape as Ginsburg mustered the courage to descend a single step off the bench and finally disappeared behind the red curtain. The contrast between the real-world Ginsburg and the comic-book superheroine of social media was striking. 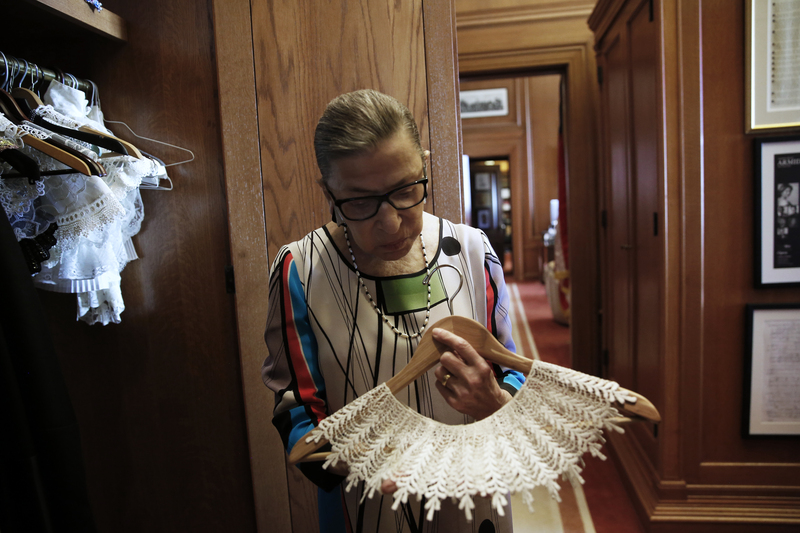 Author Stephanie Mencimer cites several articles, published between 2011 and 2014, that urged Ginsburg to retire — and makes the claim that the 85-year-old justice appears to enjoy her celebrity. Vox’s Ezra Klein argued that Ginsburg is now stuck, saying that even if her personal circumstances would have her leaning toward retirement, she is now unable to do so. And so, atop the difficulty of recovering from two broken ribs and a cancer surgery just five years shy of her 90th birthday, she’s bearing the weight of American liberalism on her shoulders. I don’t know if Ginsburg would, at this point, prefer to retire. But even if she would, she knows she can’t. That’s a pressure no one should have to bear. Klein’s conclusion reaches back to a campaign idea floated by Energy Secretary Rick Perry — 18-year terms for Supreme Court justices. The goal would be to ensure that each president would have the chance to appoint two justices during their time in office.